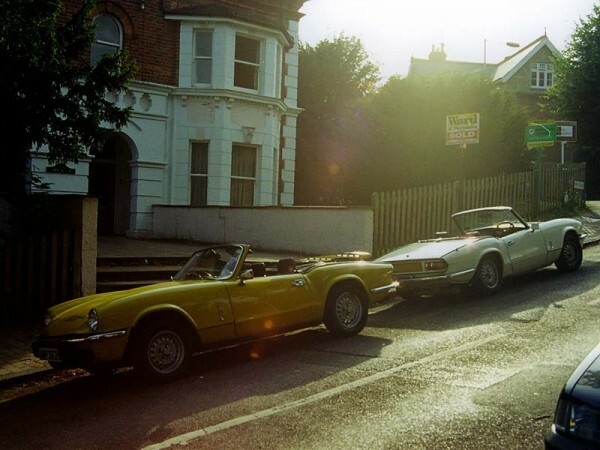 When I lived in Tunbridge Wells in Kent my neighbour also had a Triumph Spitfire 1500 – in fact is was partly his Spitfire that prompted me to seriously think about buying one for myself. His Spitfire was painted in Inca Yellow and was generally in better condition than my white one. He was lucky and had access to a garage to keep his car dry. During the late summer of 1998 our two Spitfires were often to be found parked next to each other outside the flats where we lived and on the sunny Sunday when this photo was taken we’d both been out for drives in the Sussex countryside. It’s difficult to see from this picture but his car had a luggage rack screwed to the boot lid – not an arrangement that I’d recommend. He also had started to regret the decision of screwing the rack in place for although the rack was more secure there was some rust appearing around the holes that were drilled through the boot lid. The hill where we lived was a good test for any car’s handbrake and I had to adjust my Spitfire’s handbrake as one of the first items of maintenance I did.